Greenlane is a suburb of Auckland, New Zealand. The Greenlane shops are the main shopping centre for the suburb of Epsom and are situated at the intersection of Manukau Road and Green Lane West. On the northern side of Green Lane West are located the Alexandra Park Raceway and the ASB Showgrounds (formerly Epsom Showgrounds); on the southern side is Greenlane Hospital, Cornwall Park, and Maungakiekie / One Tree Hill and its park. The Greenlane shops developed during the 20th century, servicing the needs of the local community and visitors to the raceway, showgrounds, hospital, and parks. There was also a tramway terminal located here from 1902 until 1956. The make up of the local businesses has changed over the years; currently Greenlane is a centre for the antique and motor vehicle trades and the location of a selection of restaurants. The 1920s Lido Cinema still operates, one of the few stand alone suburban cinemas to do so. The area is served by state secondary schools including Auckland Grammar School, Epsom Girls Grammar School and St Peter’s College. The suburb itself is one word (Greenlane), whereas the thoroughfare is two (Green Lane). From the 1840s until the 1890s Greenlane was noted for its rich pasture land which supported both dairy herds and grain crops. Initially large country houses and farms dotted the landscape but from the 1890s onwards suburban development spread southwards from Newmarket across the fields of Epsom. 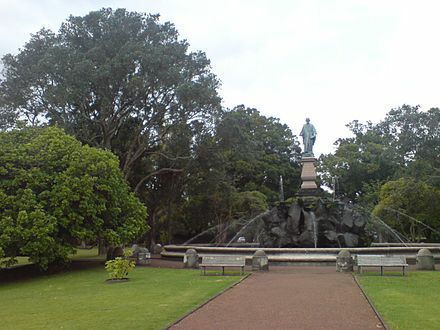 This was the reason Dr John Logan Campbell gifted part of his One Tree Hill farm to the city as a public park in 1901. Since the early 1990s there has been a considerable amount of “infill” housing with clutches of townhouses altering the streetscapes in some parts of Greenlane. The broad, flat pastureland here at the intersection of Green Lane and Manukau Roads was used for sporting events from the 1850s onwards but the Alexandra Park Raceway and ASB Showgrounds were only formally established around 1900. The Alexandra Park Raceway was named after the then Princess of Wales (later Queen Alexandra), and specialises in trotting races. The showgrounds have been the site of many trade exhibitions and agricultural shows, especially the annual Auckland Royal Easter Show. Adjacent to Alexandra Park was the Auckland Electric Tram Company tram depot. Organised in 1902 the tram company had storage sheds and an administrative office block built here as it was half way between Auckland and Onehunga. The system was torn out in 1956 but the sheds remained here until the late 1970s when they were replaced by an office park. The administrative block survives as a restaurant. bequeathed money for many charitable works. The National Women’s Hospital dates from the late 1950s and was an icon of modernity in its day. During World War II large numbers of prefabricated buildings were constructed in the eastern part of Cornwall Park in readiness for wounded and sick American soldiers to be evacuated from Guadalcanal. The buildings were used during the 1950s and 60s as maternity wards until the adjacent National Women’s Hospital was fully open. The buildings were progressively reduced in number in the 1960s although some remained standing empty until the mid 1970s. Now only the flag pole remains as a memorial to the wartime usage.